Genocide orphans and survivors asked a hard question, a rhetorical one, “How did we arrive here?” The answer to the question culminated into what turned into a tough speech. These kinds of question evoke Kagame’s emotions. Indeed the question set precedence for the day’s direction of the speech, a very uncomfortable speech minutes later. The President began his speech with lines in Kinyarwanda for about ten minutes and then later everything got twisted. “Like now,” he said switching to English, all foreigners dropping their earphones to pay attention to a seemingly irritated President. The subject of genocide denial, negation and the idea of a double genocide that has been going on in the academia, conferences, and many other platforms for over two decades now, is something President Kagame has not enjoyed at all, same as genocide survivors and orphans. As usual, he throws in comic even when it is a tough talk. “You know…human beings, I think we are good people, with ability but we are bad people at the same. When comes a small thing, we display our weakness,” Kagame said, as he tried to express the irritation Rwandans have had to endure while the world tried to find a different definition of the Genocide against the Tutsi. Many scholars, the likes of Filip Reyntjens; a Belgian academician who has feasted on the genocide denial project, have tried hard to revise the history. 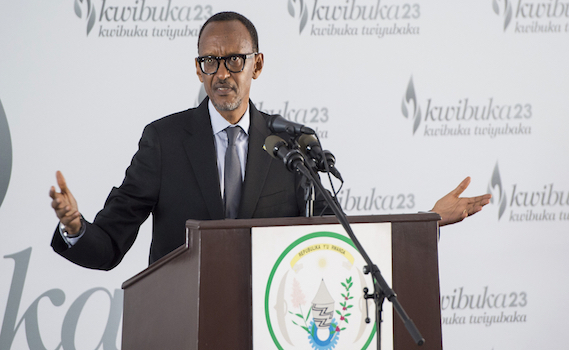 The sound bites from Kagame’s speech carried highs and downs. As he delivered his speech, then threw in tougher words, and then cooled them down with encouraging words, empathy as he acknowledged those siding with Rwanda and the survivors. “As Rwandans, we should not get lost in this nonsense or diverted by this nonsense. We have our lives to live. We can’t live by this nonsense that is there everyday Genocide, genocide has a definition and I am not the one who put that definition there. When you talk about Holocaust. It has its definition. I am not the one who put the definition there. If you have the problem matching that definition with what happened here is because you have the problem, you need to address that problem. Kagame mentioned something that caught many people’s attention. Kagame declared something that contradicts the aftermath of most tragedies and what scholars have presented every after a conflict that has been recorded in human history. “Yes a section of the people of this great nation, call it small if you want, were targeted, they were targeted for who they are. That is what it is. You can’t call it something else. The second is to say: That happened, we failed to prevent it. It happened. We can’t reverse it as of that time. We couldn’t. But today we can do something about it…. After that line, is when Kagame declared what has made him distinct and for many, something that has united the country together: Peace and assurance, reconciliation and reconstruction. This was the punch line of his speech. Guaranteeing there will be no retribution is not a word he has said. He has ensured it from the beginning, but it was the first time Kagame insists on it and defines it so clearly at a gathering during the commemoration period. “It is not talking about those who were targeted in the past, and not being targeted again in the future, it is about not targeting anybody in the future…we can’t have this again, absolutely not. This, he said, doesn’t matter what somebody else thinks, “but we are open for working together, for cooperation, for collaboration, to work with people. Kagame recognized friends of Rwanda who have “been with us in all this we have gone through.” It has been a very difficult history, he said. Times have been hard with the Catholic Church, but with the recent invitation to the Vatican, with the Pope acknowledging the church’s role in the genocide, here is what the president has said for the first time after the historic closed-door meeting. Will France read between the lines? France is implicated in the genocide against the Tutsis. France’s role is unquestionable. Ballistic investigations were conducted with evidence scattered allover the place, France’s was hands were found everywhere; same as for the Catholic Church. But the Pope threw in the towel and accepted their role and apologized, and the chapter has been closed. As the President continued to hummer his point into the audience, the discomfort in the audience was too vivid. “Les corps diplomatique” or call them members of the Diplomatic Corps made gestures of uneasiness. Kagame went on. “For the time being, we shall live with that but there is always going to be a cut off point.” Now, this sunk deep. A French diplomat in the audience froze as eyes from different angles project to him. The same was for the expatriates all present at the event. The President had said enough already. But there is one thing he couldn’t spare; the UN. The UN failed Rwanda by its failure to intervene, despite having all the resources and the full knowledge of the incidences. After the speech, the whole nation turned dark, with a gloomy sky It rained. Heavily. And that is exactly how it looked on April 7, 1994. Rwandans remember. A national vigil was held at the Amahoro National Stadium, with candles lit, well seen from far above the sky.